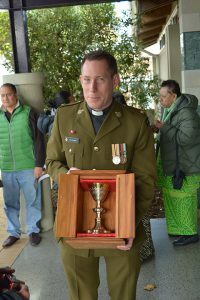 WelCom June 2017: The chalice of Petone WW1 chaplain, Fr James McMenamin, was returned to New Zealand after his death in Belgium on the second day of the Battle of Messines in 1917. One hundred years later, it is on its way back to Belgium to be used in the memorial services for Fr McMenamin in Mesen and Nieppe on 8 June 2017. After the Battle of Messines Fr McMenamin was conducting a funeral service for fallen soldiers when, under enemy fire, six soldiers were injured and Fr McMenamin was killed. He was buried in Belgium, then reinterred at the Nieppe Communal Cemetery in France. Fr McMenamin’s chalice, a gift from the Petone parish, was returned to Sacred Heart Church, Petone, and has been used during services there ever since. At Sunday Mass at Sacred Heart Church last month, St Bernard’s College principal Simon Stack and a group of students gifted a New Zealand-timber case, especially made by the students, for the chalice. 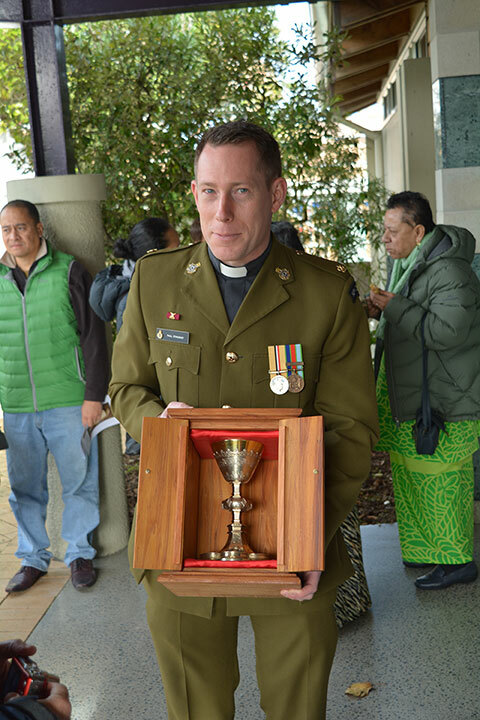 Following Communion, parish priest Fr Marlon Maylon placed the chalice in the case and handed it to NZ Defence Force Chaplains, Padre Ants Hawes and Paul Stanaway, for its journey to and from Belgium. A karanga by Mandy Scanlon and a haka by St Bernard’s College students farewelled the chalice. A 100-year anniversary Mass commemorating Fr McMenamin will be celebrated at Sacred Heart Petone on Thursday 8 June at 7pm. Cardinal John Dew will be the chief celebrant with several priest chaplains concelebrating. All are welcome to attend.